A Look at ’80s does 50s’ | Oh, for the Love of Vintage! Before we look at ‘80s does 50s,’ let’s define vintage. Vintage basically means the output of a particular time (in the past). Vintage is something which was fashionable or popular during an earlier period. However, when I use the term ‘vintage’ on this blog, I’m referring to anything that predates 1965. Those are my terms of reference for vintage. Today, ‘vintage’ is commonly used to denote 1980s and early 90s fashion. I will never call 80s or 90s fashion ‘vintage’, I’ll leave that up to the teenagers and twenty-somethings! ;0 When I refer to 80s fashion, I’ll simply call it just that, 80s fashion! What is ’80s does 50s’? 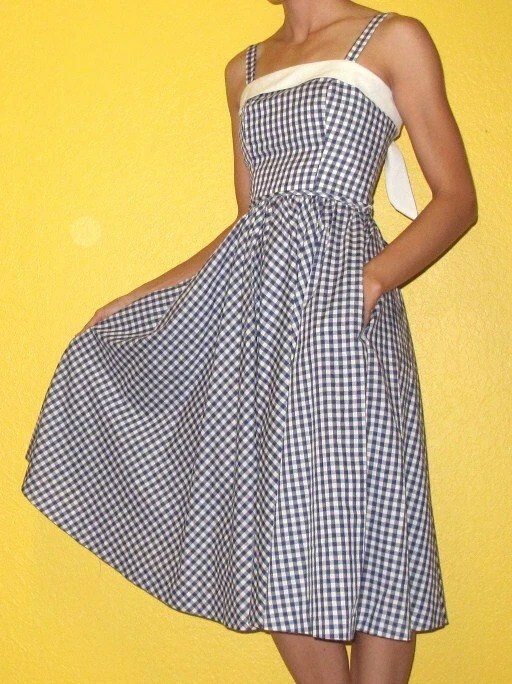 One of the only things I like about 80s fashion is that 1940s and 1950s clothing was in style. Many people wore vintage clothing and mixed and matched it with new wave pieces. The results of this melange vary (just take a look at your old photos). Ha ha! 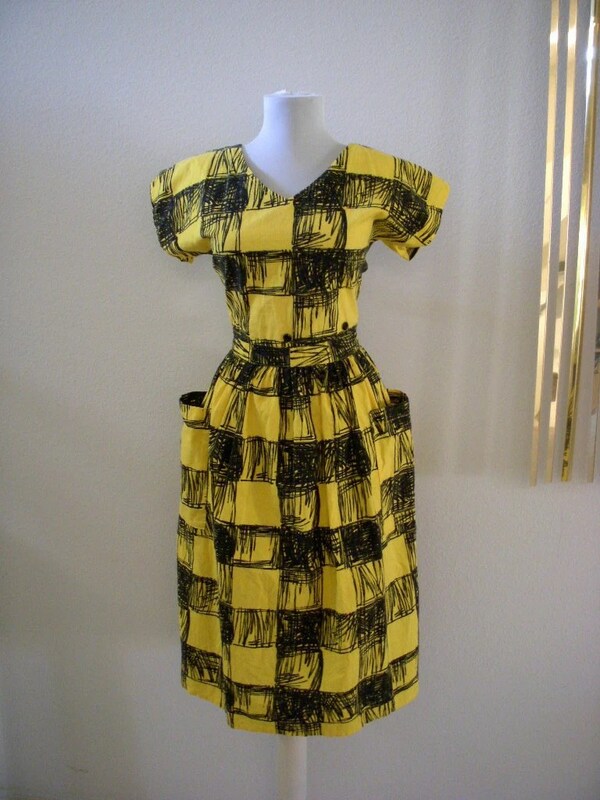 What was great about the 80s, besides the music, was the ’80s does 50s’ clothing. 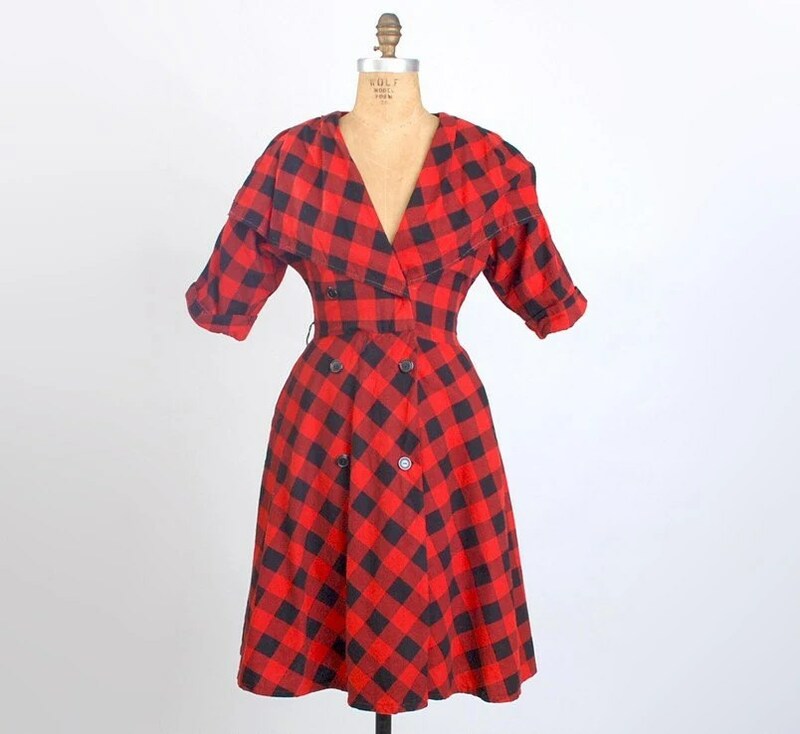 As vintage clothing was popular, many clothing designers and manufacturers started producing 40s/50s inspired pieces. ’80s does 50s’ pieces are unique in that they blend 50s styles and lines with new fabrics, bright colours, motifs and geometric patterns. The fabric: both natural (cotton, wool, silk) and synthetic/artificial fabrics (acrylic and acetate) were used in the 1950s. Fabrics like taffeta, nylon, chiffon, crimplene and satin were commonly used. The 1980s saw the resurgence of natural fabrics like cotton and the introduction of spandex (yuck). The zipper: if the zipper on the garment is metal, it was made prior to 1960. If the zipper is plastic, it was made after 1960. Dress labels: 50s dress labels and 80s labels do not look similar for the most part. Of course, each tag is different. I don’t know how to explain it without showing you, but 50s labels just look, well, OLDER! Check out Carmen and Ginger’s blog for label images and tips. Care labels: if the garment has a care label (washing instructions) you can assume it was made after 1960 (and perhaps after 1970 when care labels became mandatory). The notions: 50s garments were constructed better and include small details that you won’t find in ’80s does 50s’ items such as: hooks and eyes at the waist and at top of zipper and bra strings/snaps inside the dress. If you see an elastic waistband, it’s definitely not a 50s dress! As a side note, I love having bra/slip strings in my dresses and I’ve started adding them to all my repro dresses! Thanks catwalk! ;0 I’m sure there are things to add, tell tale signs I’ve overlooked! Hmmm…still pondering. Would you help me identify two sets of long beads, one with carved hearts? I brought them back from china in the 80’s but I can’t tell if they are ivory, celluloid or bone. « Oh, for the Love of…Bed Jackets and Pajama Dogs!